”Modern Heating Insulation” with headquarter in Łódź, 70 Świerczewskiego street. After several ownership transformations and changes of the name and headquarters (since 1967 Lambda’s headquarter is in Łódź, Morgowa 9 street), in its present form and name it works as LAMBDA SA since 18th February 1993. LAMBDA since early nineties creates also group with FORMAT Urządzenia I Montaże Przemysłowe Sp. z o.o. and FORMAT Baustahl- und Konstruktionsverarbeitubgs GmbH. It should be noted, that despite changes relating to the subject of activity, as a result of constant need for above mentioned works, the company continued in constant way its performance of services as demanded among our clients. Lambda provides services in chemical plants, nitrogen plants, heating plants, power plants (including nuclear power plants), pharmaceutical plants, oleo chemical plants, refineries both in Poland and abroad (Iraq, Morocco, Germany, Netherlands, Finland, Switzerland, Austria, France, Sweden, Great Britain, Ireland, Ukraine). Our services are as well provided on projects like tunnels, viaducts, bridges, stadiums, underground railways, windmill foundations, residential and public buildings. Occupational Safety and Health Management System based on ISO 18001 norm. 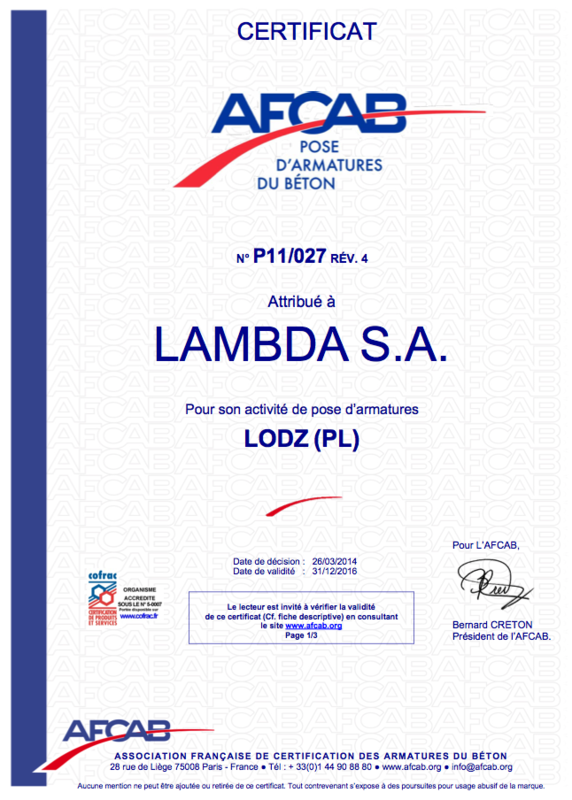 Lambda has also Reinforcement Plant certified by NordCert certificate in Łódź.